Lauki/Bottle gourd is a highly nutritious vegetable . I remember my mom always using it in sambar . Preparing kofta is one of the favorite way of using this vegetable. Kofta is a north indian preparation and is made of all kind of vegetables and is a staple in weddings etc . 1. Squeeze as much water as possible from the grated lauki . 2. Add ginger garlic paste , salt, chilli , bread and besan to grated lauki. 3. You should be able to make small balls of the mixture . 4. To get the consistency add more flour if needed. 5. Heat oil to 350 F .
6. Make small balls of the mixture and drop in oil and fry till golden and keep aside. 1. Heat oil and add cumin and fry for a minute. 2. Add ginger garlic paste and onion and cook till golden. 3. Add chili, turmeric,coriander ,salt and cook for 2 minutes. 4. Add tomato puree and cook till oil separates. 5. Add 1 cup of water , garam masala and simmer for 3-5 minutes. 6. Add fried kofta /dumpling to the gravy and simmer for another 5 minutes. 7.Garnish with chopped cilantro and serve. really delicious one.i know its avery yummy one..the bottlegourd dumplings really a nice recipe. It is a long time since I made koftas,thanks for reminding and coming up with a wonderful and delicious sabji. I dont like that much..but I wont mind having it this way..delicious preparation!! Lovely koftas and the gravy looks spicy and delicious. This look very delicious. Love all the spices. I would enjoy dipping crusty bread into it. i just cooked lauki for lunch n here u hv lauki koftas...my all time fav curry. I have never tried anything with bottlegourd. Kofta with bottle gourd sounds and looks delicious!! Nisha,,delicious lauki dumpling curry dear,,we too cook dal dumpling curry i like that very much..
new to me..looks so yummy!! Looks spicy and delicious curry. 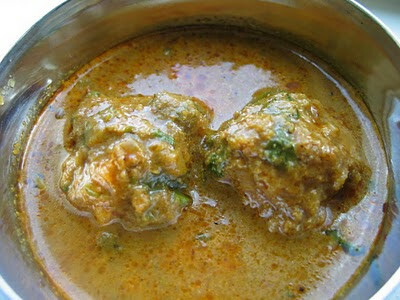 I love all kind of kofta curries, they are simply yummy. Your version is lot better and this picture is very tempting to me...made me hungry, hehe. the kofta looks so good! tempting and yummy! Lauki Kofta is one of my favorite.. I will definitely try this.It looks yumm.So good. I am glad to follow your blog. Lovely! I can just tell these kofka taste amazing. Thanks, Nisha, for your great MLLA recipe!